This article explains what energy management is, why it is important today, and how you can use energy management to better understand your organization. It's aimed at anyone who wants to know more about energy management within a building, be it your office, the school your children go to, or even your home. We’ll start with the what, then the why and finally the how. Energy management can be broadly defined as the proactive, organized and systematic management of energy use in a building or organization to satisfy both environmental and economic requirements . Whether you associate energy management with energy-saving efforts that focus on making better use of existing buildings or equipment, or with energy awareness, it doesn’t matter. Energy management is a process that does not limit to large buildings and offices. You can apply the same principles for your home and therefore continue the positive loop explained in the four steps above (collect, identify, act, track). Energy management is the foundation for saving energy at your organization level. A recent study by the U.S. Energy Information Administration projected that world energy consumption will grow by 48% between 2012 and 2040 . With growing demand and shrinking supply of non-renewable natural resources like coal, energy costs are set to rise. In addition, regulators worldwide are pushing for more stringent sustainability standards. Singapore will introduce a carbon tax on greenhouse gases from 2019. In 2011, FTSE launched the FTSE4Good ESG Ratings to measure and rank companies' environmental, social and governance (ESG) risk and performance. Following its counterpart in Hong Kong, the Singapore Exchange (SGX) also mandated sustainability reporting for listed companies in June 2016. This mandates businesses to objectively review and report their environmental and social impact in operations and corporate governance. We need to save energy in general for our planet to reduce the damage we’re doing and reduce our dependence on the fossil fuels that are becoming rare. Reduce risk: the more dependent and consumer of energy you are, the higher the risk on your profitability is. In such a world, saving energy makes good business sense. Of course, anything worth doing is worth doing well. Having a structured approach to energy management can maximize benefits and reduce risks. Many people confuse energy management with building management, equipment retrofits, or energy audits. This is a common misconception. Energy management doesn’t always involve complicated analysis or big capital investment. You can start by consolidating and analyzing your energy spending profile over time. If you have the budget, you can even have a dedicated Energy Manager. Whatever the situation, energy management is about building a basis of information for good decision-making, and then acting on that information to reduce energy use. This can be done with expertise and manual data collection and analysis, but there are more cost-effective ways. The right energy management system can automate the process from data collection to analysis to reporting. This results in greater accuracy, higher productivity, and better decisions. 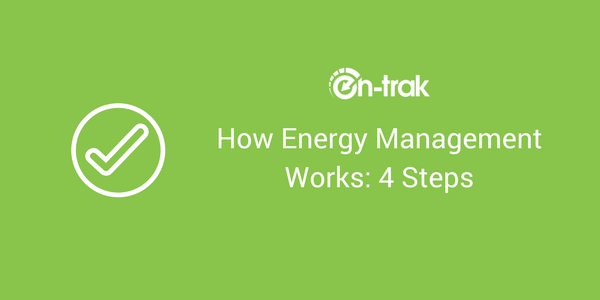 As explained above, there are four steps to the energy management process and we will cover them one by one. There is no secret here. The more data you can get, and the more detailed it is, the better. Energy data can come from your monthly utility bills, from manual meter checks (old school approach once a week, or once a month), or from automatic uploads from smart meters. Monthly bills might be an easy starting point, but you’ll see the limits of that approach very quickly. The lack of detail in terms of time, area, and type of energy use makes it difficult to find useful insights. Manual meter checks can give you a day-by-day curve, but this process is time-consuming and error-prone. Smart meters that record, store, and transmit data, where it can be viewed and processed using a dedicated software platform, are ideal. However you choose to get your data, it is a necessary first step. When you begin to investigate and analyze your data, you’ll begin to find interesting bits of information. It may be an increase in your monthly bill after adding new air conditioning units, or an increase of lighting use during overtime hours. Whatever the situation, you need proper visualizations (graphs) and analytics to find out what is happening behind the raw data. This can be difficult to achieve by spreadsheet, but simple year-on-year comparisons can be a good starting point. There are also energy management software solutions that can help you visualize trends, break data into robust metrics, and assess performance against various benchmarks. These are especially useful when dealing with huge amounts of real-time data. Achieving savings requires action. When you identify opportunities for saving, the natural next step is to act on them. Some solutions may be one-off fixes, while others may need more internal cooperation and persuasion. Building support for action can be more challenging than the action itself. It helps to provide clear evidence of the savings opportunity. When everyone agrees and understands that there is a problem, you can build momentum to take action and solve it. You can create graphs and presentations yourself, or share the findings through cloud software. Now that you are taking the right actions to save energy, it’s time to track the process and implement an ongoing improvement schedule. New problems will arise over time, and old ones may reoccur. To ensure your energy optimization initiatives succeed in the long run, you need to monitor your progress, verify savings, and respond quickly to abnormalities. Make sure your energy management system can provide you with regular performance reports and timely alerts. This lets you address problems immediately. But even without an advanced tool, you should still input your monthly bills into a spreadsheet and make sure everything stays on track. Energy management is essential for dealing with rising costs and regulatory requirements. The earlier you start the better. To do it right, you should have an energy management system to automate and optimize each of the four steps above. At the minimum, you should keep an eye regularly on your energy data, just to ensure things are not getting worse. But ideally you are considering energy management as an ongoing effort to find new savings opportunities, engage your employees and track your progress. Only then will you achieve lasting results without investing frustrating hours into manual work.